Toronto’s Soulpepper Theatre Company stages its production of Shakespeare’s A Midsummer Night’s Dream at The Young Centre for the Performing Arts through April 23, 2011. I was both amused and bewildered when I read a letter that Globe and Mail theatre critic J. Kelly Nestruck posted on his blog. It was from a Stratford theatre-goer who was up in arms over the fact that a director had chosen to “update” a Shakespearean play. I guess I’m very much a non-traditionalist. I believe that in order for a contemporary production of a Shakespearean play to be engaging and speak to today’s audiences it must be updated. After all, we’ve all read the likes of Hamlet and Romeo and Juliet in high school, and there have been thousands of traditional productions of these plays through the years. A new production should at least attempt to lend its own voice to the material and make it relevant to a contemporary audience. Moreso than many of Shakespeare’s plays A Midsummer Night’s Dream is rife with possibility for reinvention. A comedy about young lovers and mistaken identities with much of the story taking place in an enchanted forest inhabited by fairies, the play is practically a creative blank slate that allows directors and production designers to run wild. 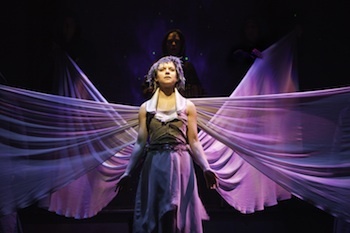 Soulpepper’s A Midsummer Night’s Dream, directed by Rick Roberts, isn’t a drastic reinvention but features updates that are simple and stylistic rather than anything too high-concept. The production gives the play an interesting, fresh look while maintaining its core. The director places the action in a vaguely early-20th century setting and takes a subdued and slightly dark approach to the fantasy elements of the play. The result is a mysterious, mildly sinister aesthetic which serves as an interesting counterpoint to the fun, frivolous storyline. In Roberts’ adaptation for Soulpepper, the play’s omnipresent fairies are dark hooded figures with obscured faces. They inhabit the stage like a silent Greek chorus. I particularly enjoyed the movement design for the fairies in the dialogue scenes between Oberon and Titania, King and Queen of the Fairies. The hooded fairies execute a flowing, stylized choreography and assist in creating an effect where Titania seems to float about the stage. Lorenzo Savoini’s lighting design keeps the stage dimly lit and features tight spotlighting on the actors. Ken MacKenzie’s spare set is inventively embellished by small objects casting large shadows onto a scrim. The ominous tone of the show is further accentuated by Mike Ross’ sound design featuring crystal wine glasses and hand-held bells used to eerie effect. The show is well paced and doesn’t tend to drag. The first half seems to fly by. The cast ably handles the material mostly delivering the lines in a free-flowing naturalistic style. Some cast standouts include Gregory Prest’s mischievous imp Puck; his delivery falls halfway between playful and sinister. Mike Ross reads the character of the lovelorn Lysander as a sort of lovable dork. Ins Choi and Trish Lindström’s performances as Theseus, The Duke of Athens and his betrothed Hippolyta, The Queen of the Amazons are deliberately staid to contrast with their larger-than-life fantasy alter egos Oberon and Titania, King and Queen of the Fairies. Oliver Dennis gives a hilariously over-the-top performance as the scene-stealing Mechanical Nick Bottom. In general the cast deftly handles the comedy of the play. The four-way lovers’ quarrel between Hermia, Helena, Lysander and Demetrius unfolds with a great rhythm and the play-within-the-play by Nick Bottom and The Mechanicals in the final act had the audience in stitches. Overall, Soulpepper’s A Midsummer Night’s Dream is a fresh, funny, accessible and highly enjoyable production. My play-going buddy Marty had not been to a Shakespearean play in years and although it took him a while to get used to listening to lines in old English again, after a few scenes he was laughing along and he said afterward that he really enjoyed the show. Because of its light, fun subject matter, A Midsummer Night’s Dream would make a great introduction to Shakespeare. The Soulpepper production is accessible enough so that even if you were not somebody who would normally go to a Shakespeare play, you would likely still enjoy it. – A Midsummer Night’s Dream runs until April 23, 2011 at the Young Centre for the Performing Arts, located at 55 Mill Street, Building 49, in the Distillery Historic District. – Tickets range from $28 – $60 (plus HST) and are available by calling the Young Centre box office at 416.866.8666 or by visiting www.soulpepper.ca. – $22 tickets are available for 21-30 year-olds at www.stageplay.ca.